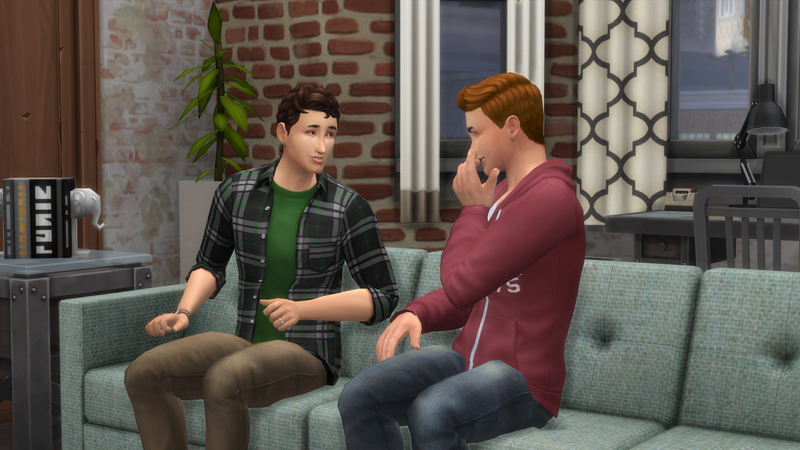 Alec and Jeff’s 5th rotation was probably one of my favourites by far; it is eventful and I am excited to share! 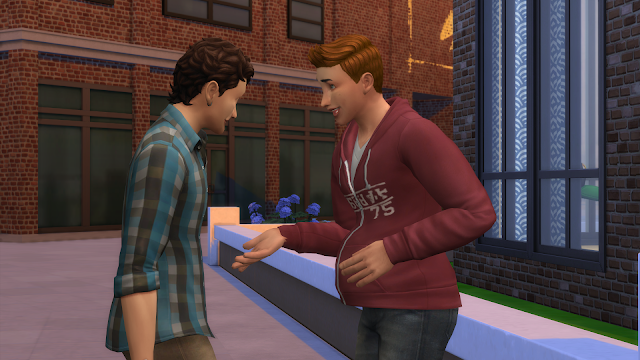 Jeff got a slight update to his look - his old shirt had some sort of lighting issue with the chest, I noticed? 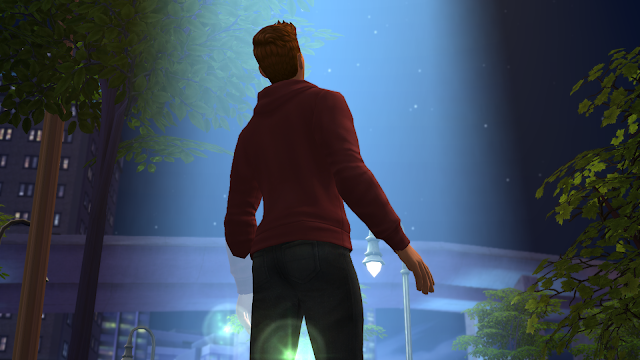 So I switched his to this basegame hoodie. 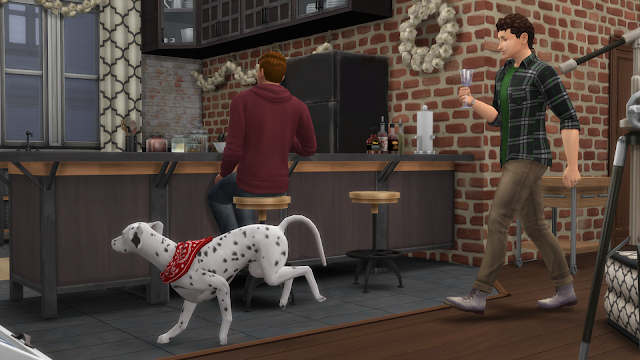 I also added a new outfit variation for Alec that’ll pop up in some pictures, which is just a blue version of his current black plaid, and the same jeans. 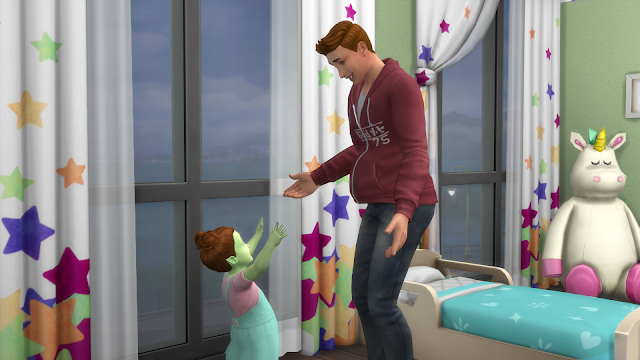 Andy invited Alec over to her house, and it gave him an opportunity to meet little Luna! 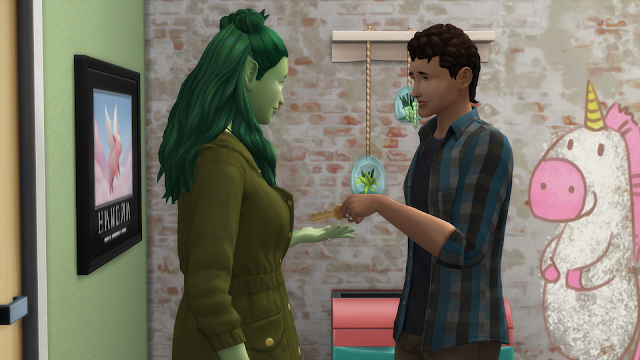 I also noticed Andy no longer had a key to their apartment (perhaps because they moved? 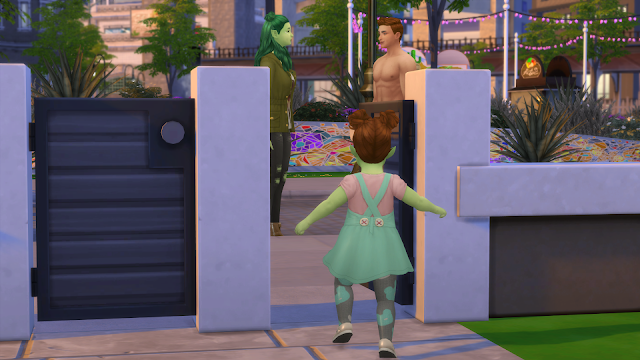 ), so I had Alec give her one to encourage more neighbourly visits. 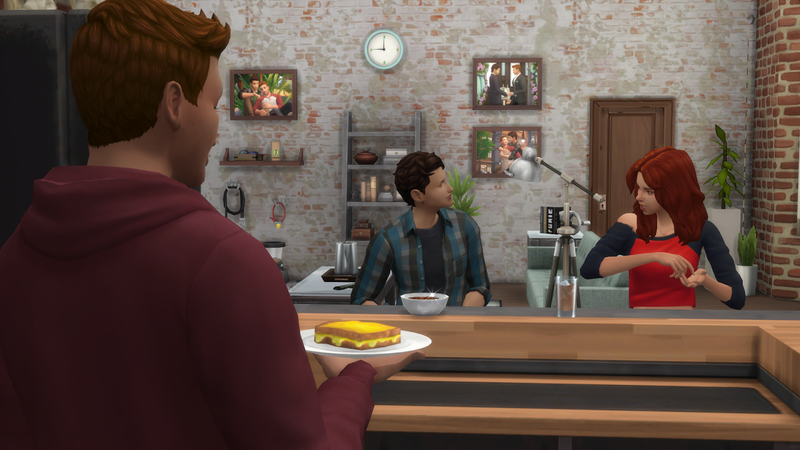 The four of them probably have the best neighbourly relationship of all the Paraneighbours. 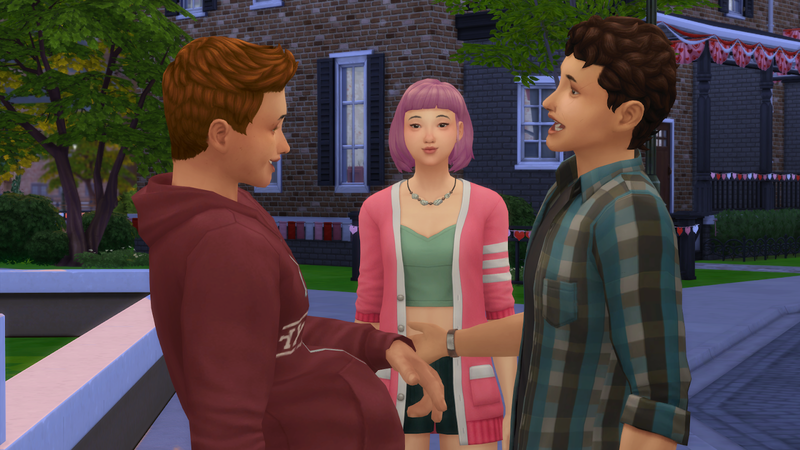 Speaking of neighbours, Jeff finally got to meet his new bro Lacie! 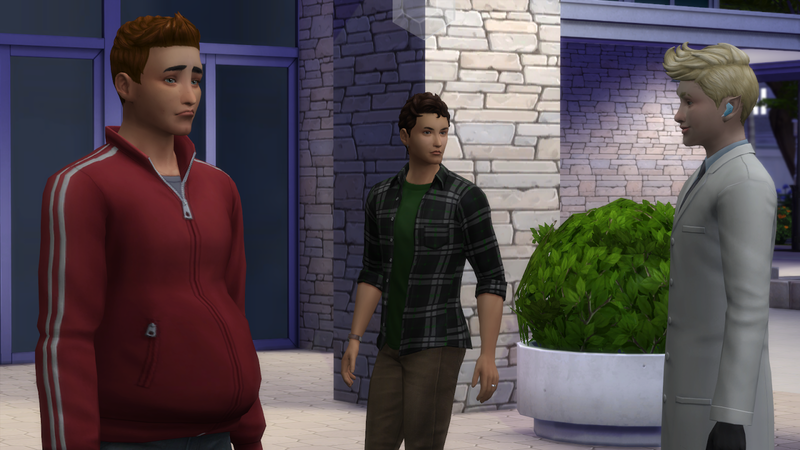 She exchanged a few bro hugs and such with Jeff, and then joined the boys for some dinner. Which is only fair, I guess, considering often Jeff likes to raid her refrigerator in her gameplay. 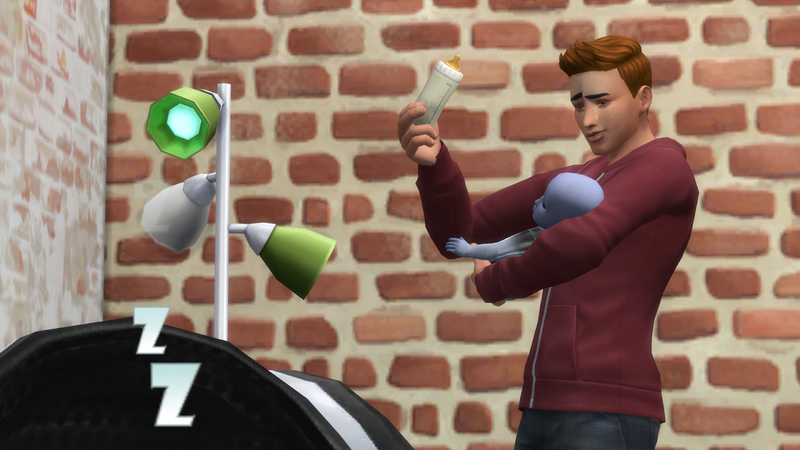 Now, I had set my plans for Alec and Jeff’s future kids in motion long before they were married, or even engaged. 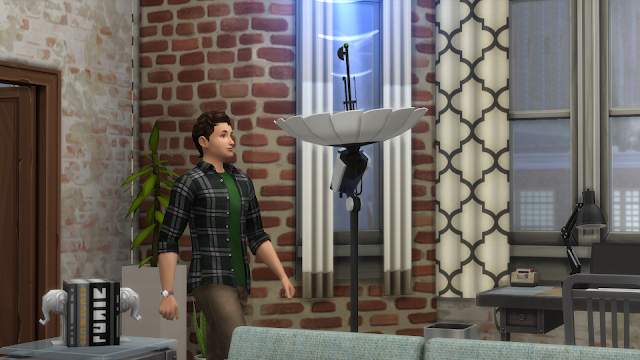 I mentioned back in Andy’s first update that I was hoping there’d be a way for me to encourage abductions, and I discovered the satellite dish from the scientist career would increase the odds. I had her invent an extra, gift it to Jeff and Alec, and finally pulled it out this round, eager to start attracting some aliens. This is basically half my gameplay with them. They’re such dudes. I recently reworked Skye Fitness so that I could fit in the rock wall treadmills from Fitness Stuff, and I sent Jeff down to work on his rock climbing skills a little more this rotation. He’s gonna be far too busy for any gym visits next rotation. 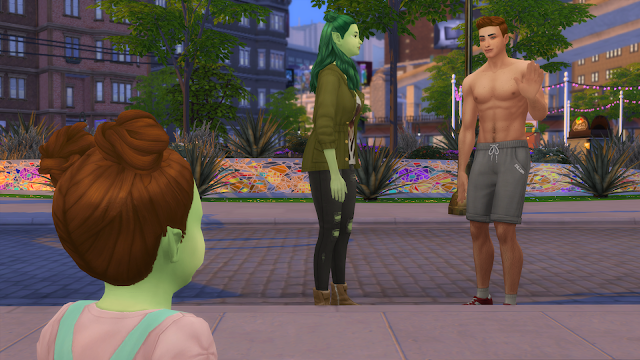 He ran into Andy while he was at the gym, and they stopped to shoot a few hoops for a bit. 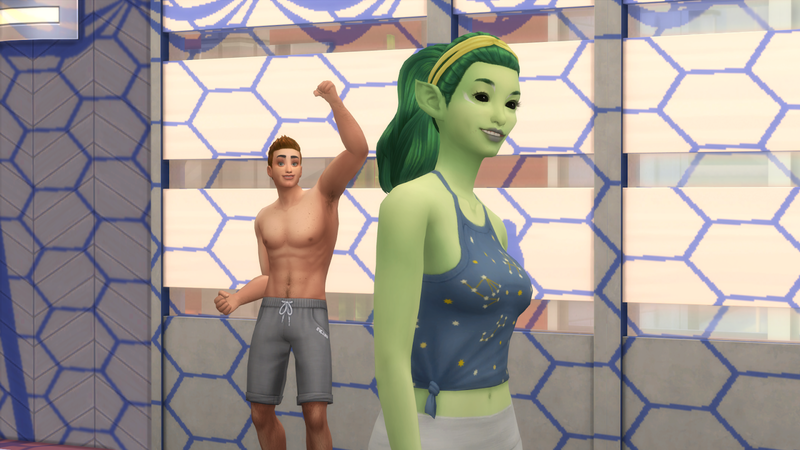 Jeff, being both a good boy and a bro, cheered for her whenever she took a shot. They’re such good bros! 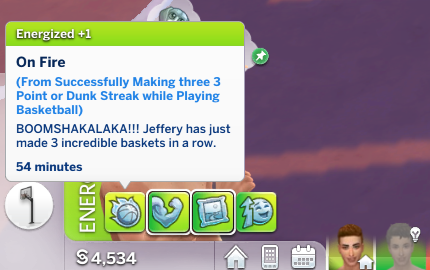 One day I’m going to have to get Jeff to win that unlockable basketball trophy. I think he needs something like 73 wins? 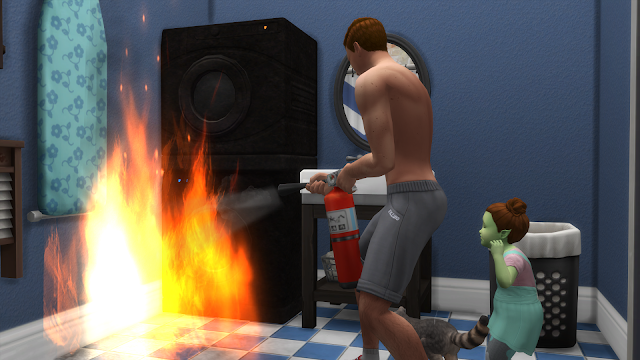 It took approximately five minutes for disaster to strike. 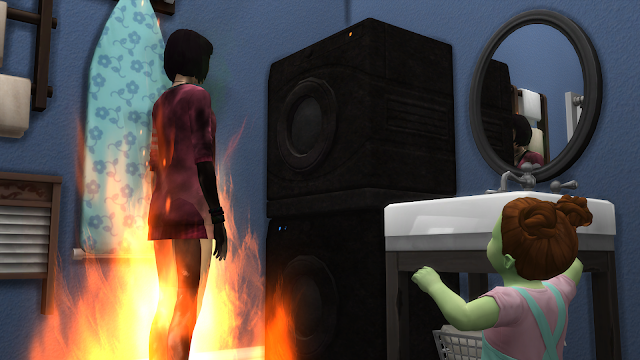 Miko, for reasons unknown, felt compelled to do some laundry while Jeff was visiting, and started a lint trap fire. I was unable to exit the lot due to said fire, and I was having difficulty getting Jeff to extinguish Miko - the option just wasn’t popping up? 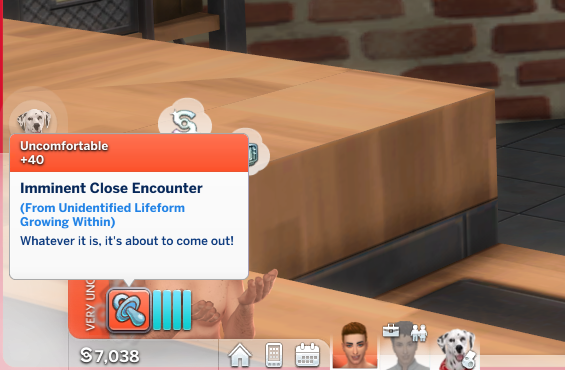 After a few seconds she ran outside, and I was thankfully able to have him put it out after that. 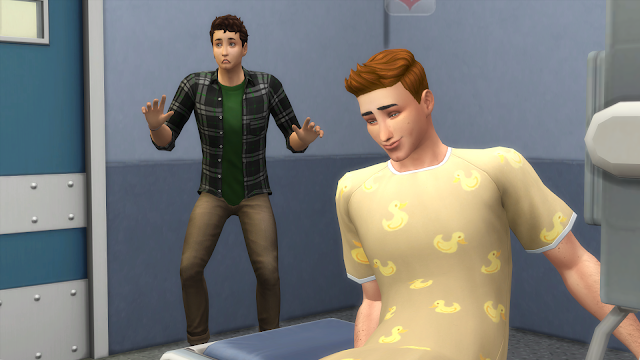 He left to go home and shower after that, and Alec joined him by taking a bath. 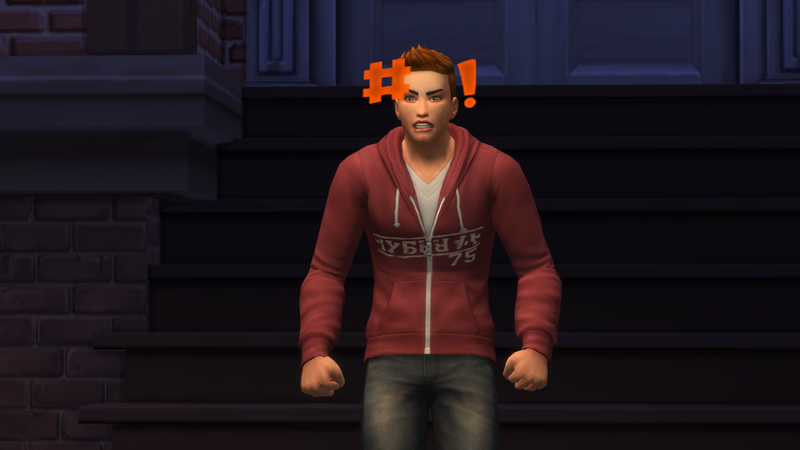 He was pissed when he returned home from his alien encounter. But, with a little affection from his two favourite bros, he was back in a good mood after his abduction (and seemingly unaware of what was about to come). 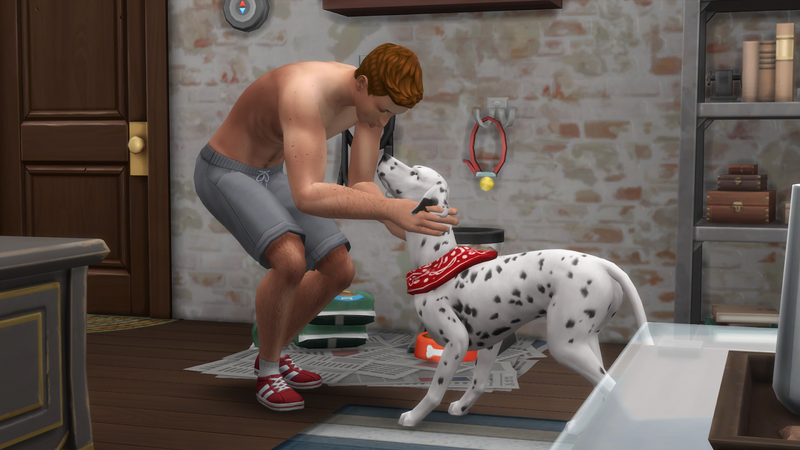 This has been, and will continue to be a pretty Jeff-heavy update, so here’s a quick run down on what Alec’s been up to. 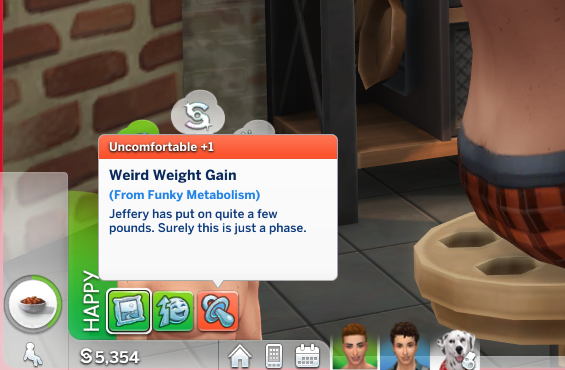 Jeff has noticed something’s up. 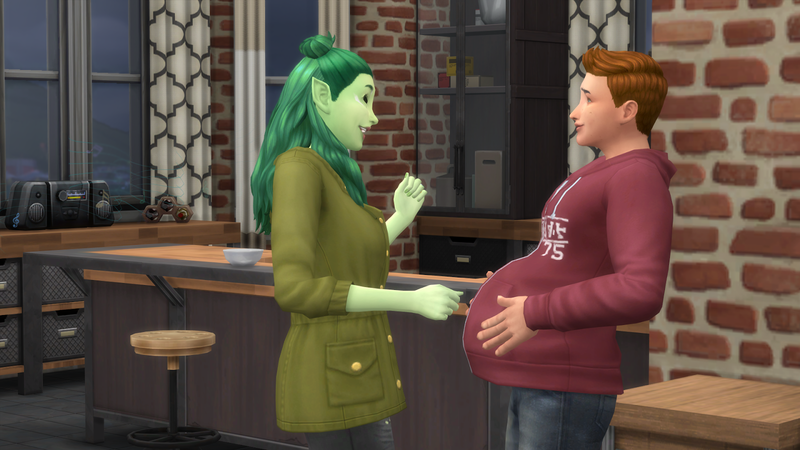 I love the moodlets for alien pregnancies, and how they’re super negative and come from a place of deep denial, whereas the regular ones are very positive like “yay, a baby!!”. 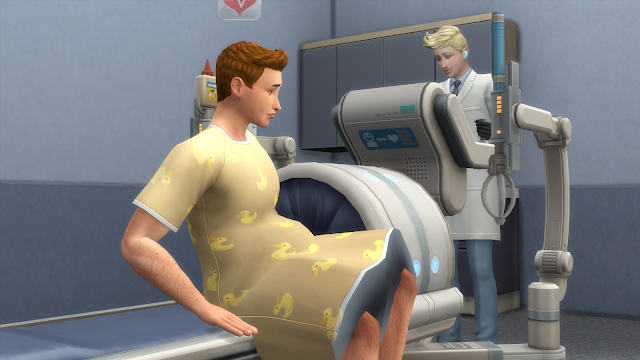 I just wish they were a little more informative as to how long until the next trimester change. "Bro, come on bro! You're getting fat; look at you bro you're letting yourself go!" 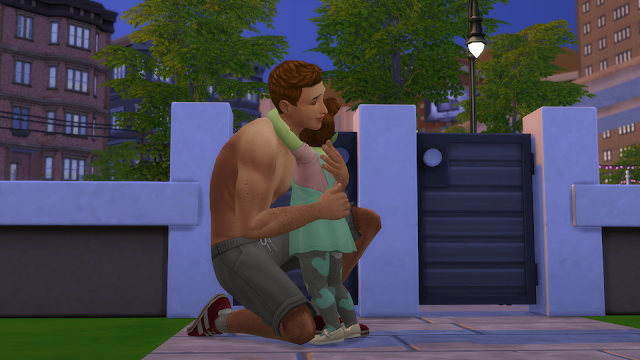 Lacie shows up to pump Jeff up for a quick work out sesh. She probably noticed the weight gain, and had some concerns. 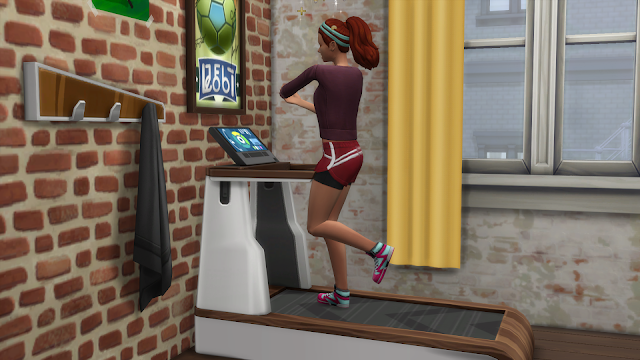 She then hops on Jeff's treadmill, which is his only piece of work out equipment, so he does not end up joining her for a quick work out sesh. The denial continues. It probably is just a little weight, right bro? Nothing to worry about. 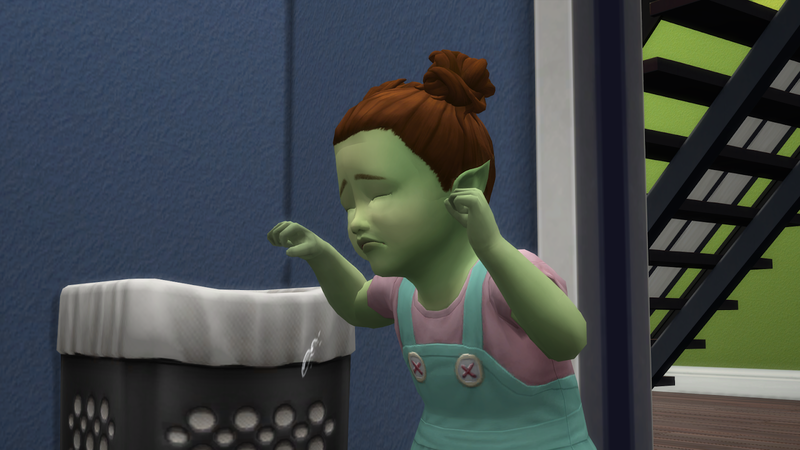 "Oh no, bro... I am letting myself go." 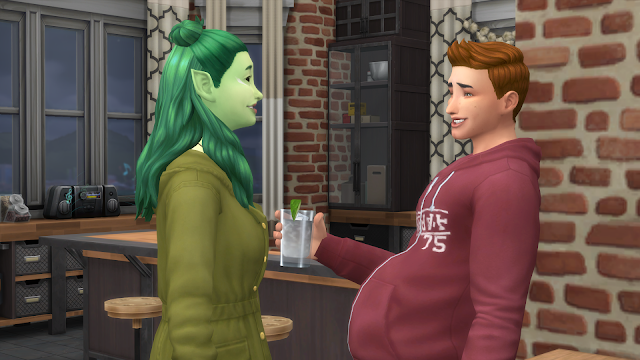 Honestly, the super muscular baby bump just looks hilarious. Miko invites the boys over again, and Jeff’s stomach continues to grow, and occasionally emit light. 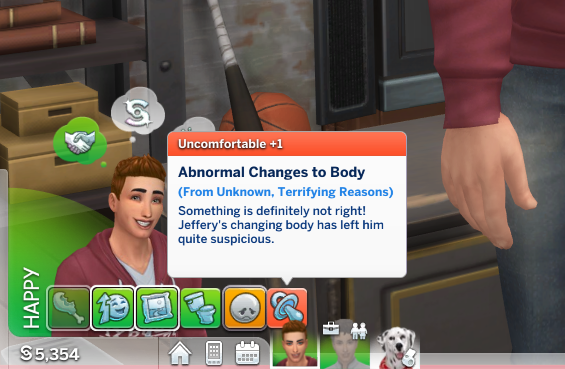 Normal stomach stuff, really. 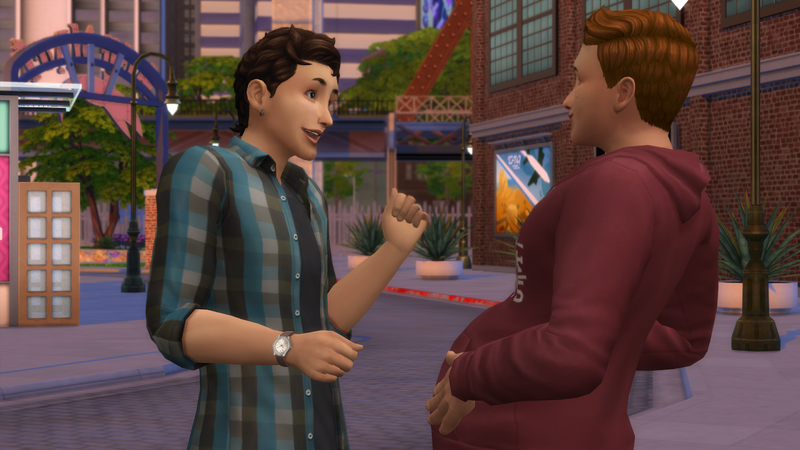 Jeff seems to have figured out what’s going on at this point, because I was able to have Alec ask about the due date, and feel the baby. He seems pretty stoked, but it’s possible Alec is now in deep denial at this point. 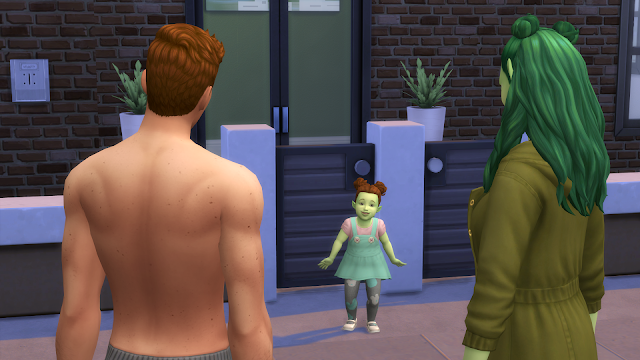 Mr. ‘What do you mean my next door neighbour is an alien?’ vampire hunter becoming a proud alien dad will be interesting. They finally went inside, and Jeff spent a little time with Luna again. 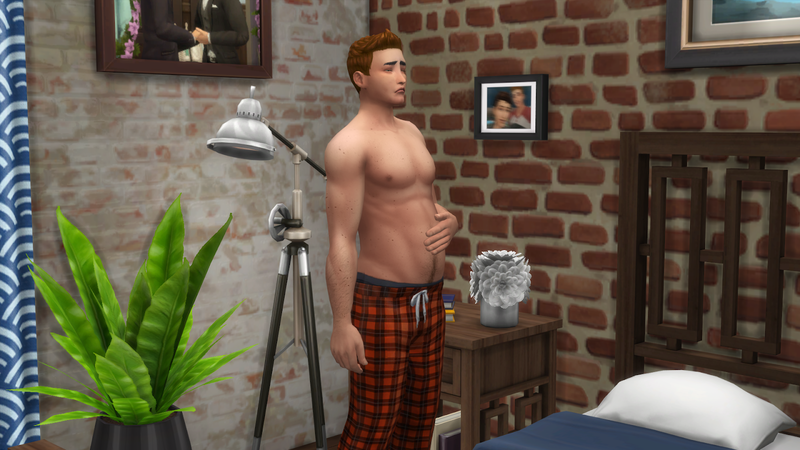 He looks like he’s ready to be a dad! 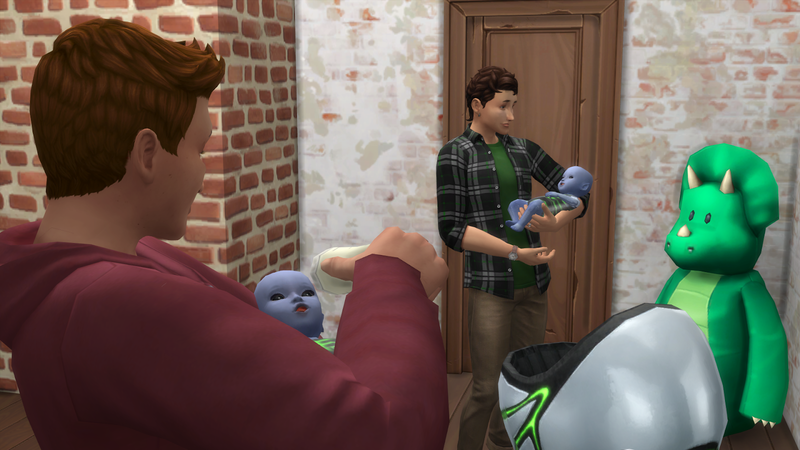 Andy also popped by their house a little later to congratulate Jeff on his soon-to-be alien baby, and then played a little foosball. On that note, playing foosball with a giant belly seems like a great way to get jabbed in the belly by one of the sticks. 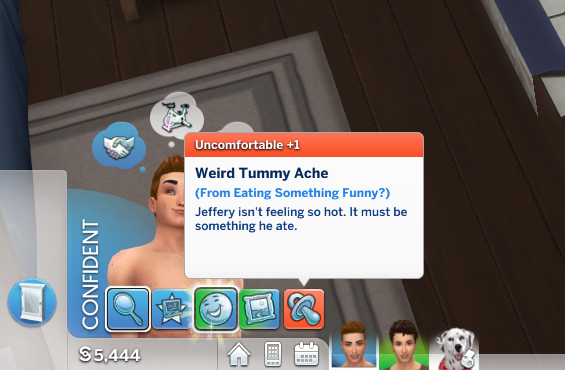 Jeff, please. Drinking is not the way to cope with this. 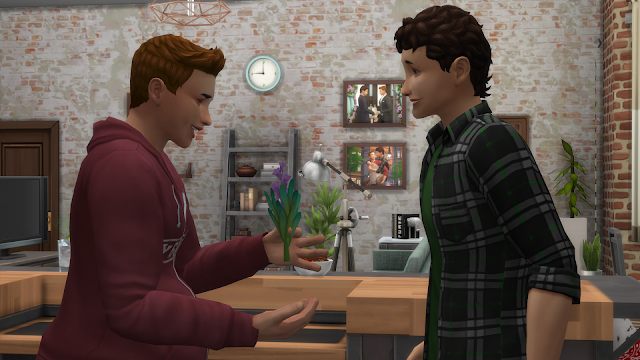 Love day rolls around, and Jeff and Alec spend a little quality time together. 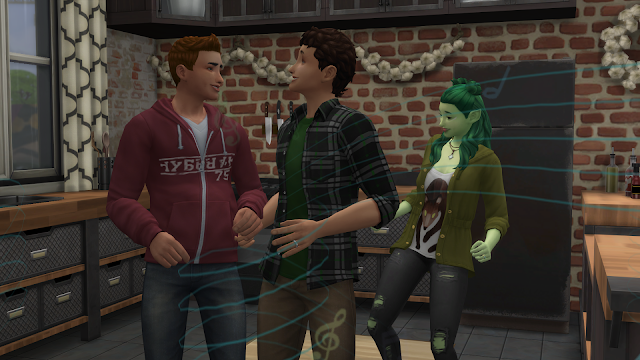 I particularly like this last picture, where it looks like they’re holding hands, meanwhile Andy's pelvic thrusting behind them as the simlish cover of ‘Hot in Here’ plays. 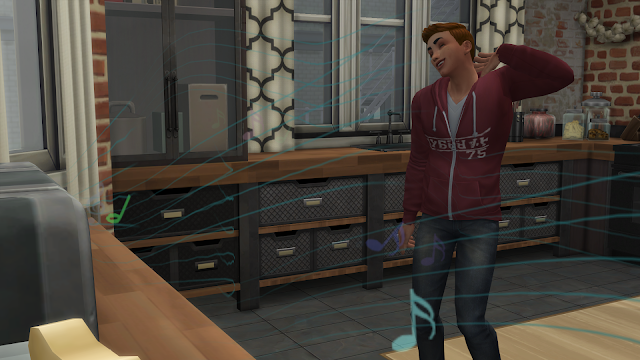 He really enjoys dancing; it's very wholesome. 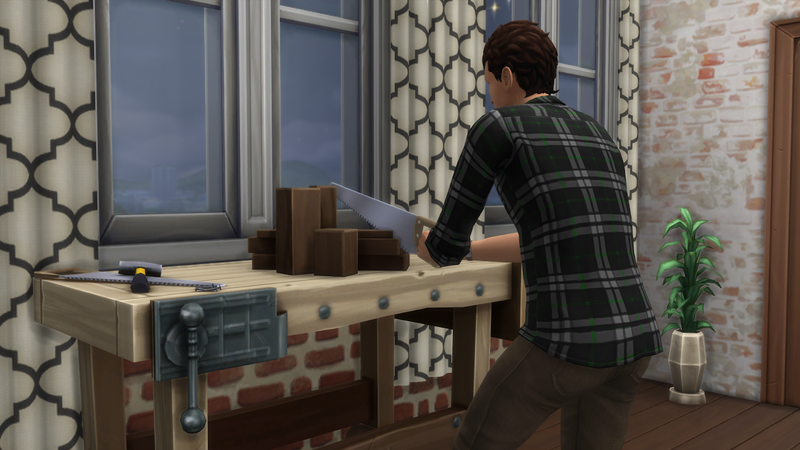 Jeff topped his cooking skill this rotation, and got entirely too enthusiastic with some knives. 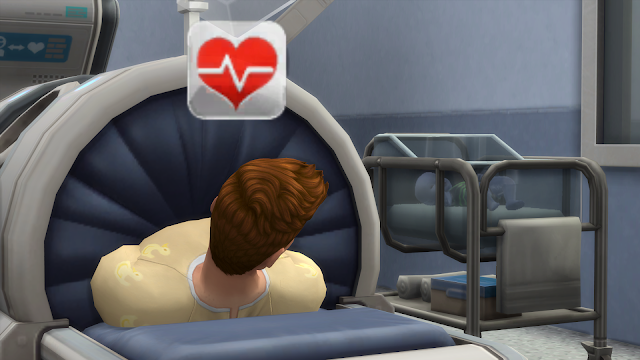 Jeff and Alec get sent off to the hospital, where Felix has apparently been promoted from intern to doctor. He also appears to be wearing airpods, so this should go well. Despite his airpods and lack of work experience, Felix manages to successfully deliver not one, but two babies! Where is Alec during all of this, you may wonder? Alec does eventually make it to the delivery room to panic, after I cancelled his tv-watching session. 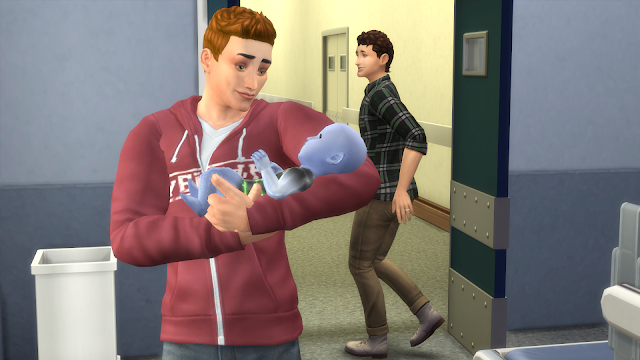 ...and then he flees the delivery room once Jeff picks up their new baby. Please note that he is running back towards the waiting room so he can “watch cooking shows for ideas”. Again. 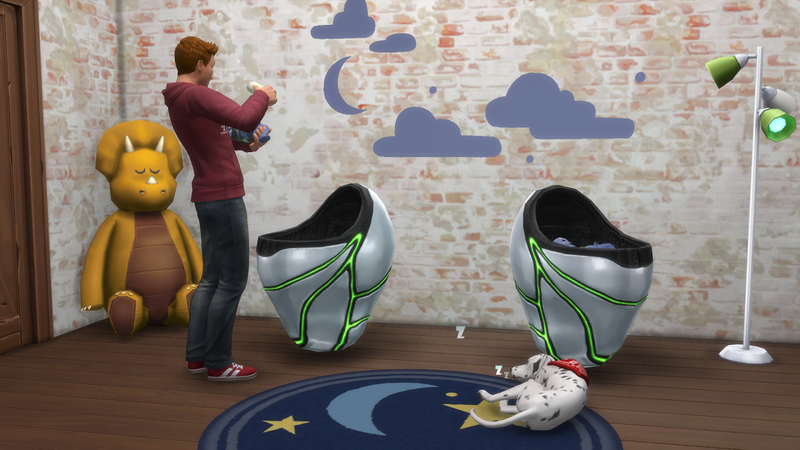 Upon arriving home with their babies, I discovered that aliens get snazzy little pods for bassinets! 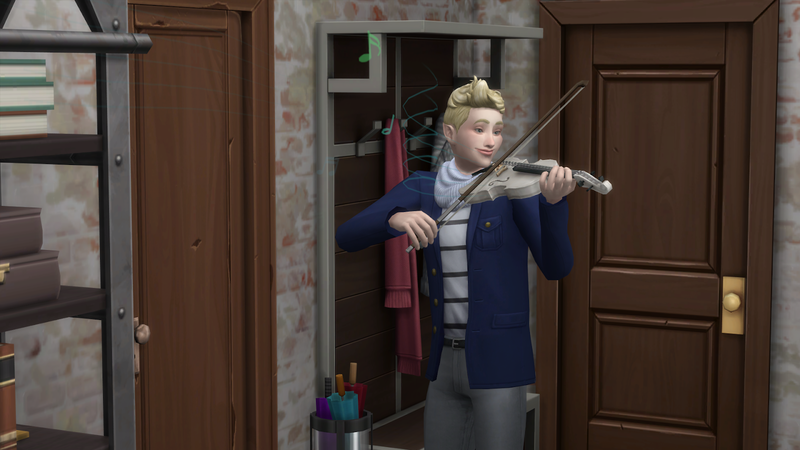 Alec finally stepped up and remembered it is time to be a dad, not watch the cooking channel, and during all of this Felix appeared at some point to serenade them outside the nursery with his violin. Man, I love the sims. Now, my plans for naming the twins relied on them both being boys, because I wanted to call them Pollux/’Paul’, and Castor/’Cas’. 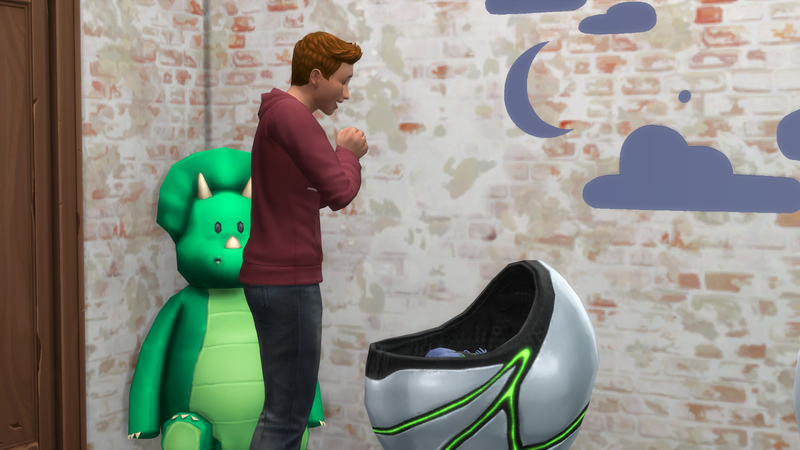 However, they ended up with a boy/girl set, and I realized Pollux/’Polly’ still worked really well as a name, even if it didn’t quite fit the mythology of them being twin brothers. 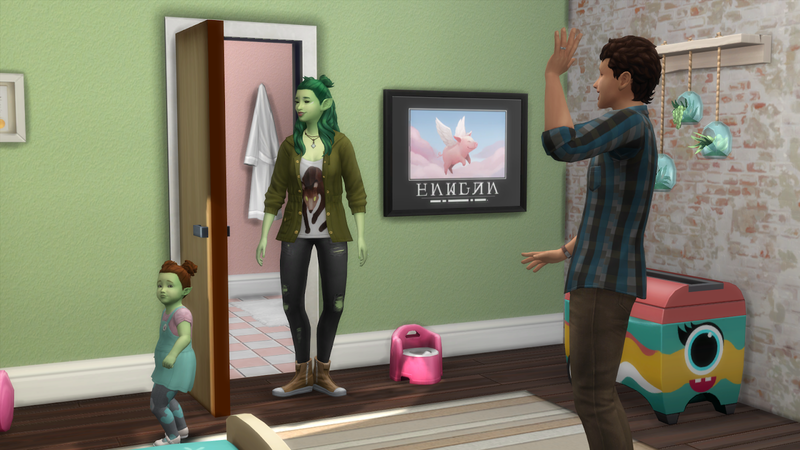 So, welcome Polly and Cas to the Paraneighbour bunch! 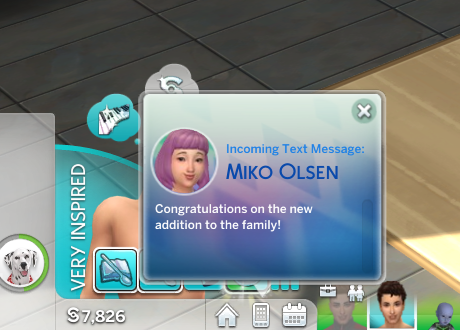 Miko sends her congratulations, but only to one of the new additions, so I guess she’s already got a favourite.